Tomorrow is the mid-point of winter, halfway between the winter solstice and the spring equinox. It’s also Candelmas in the Christian church and Groundhog Day in Punxsutawney, Pennsylvania. A very special groundhog, Punxsutawney Phil, will make his prediction just after dawn tomorrow morning, 2 February around 7:20am. I don’t know if he’ll see his shadow and predict six more weeks of winter, but I do know it won’t feel so wintry tomorrow. We’ll be out of the deep freeze at last! A high of 41oF in Pittsburgh and 37oF in Punxsutawney. Watch Phil’s prediction online at visitpa.com. 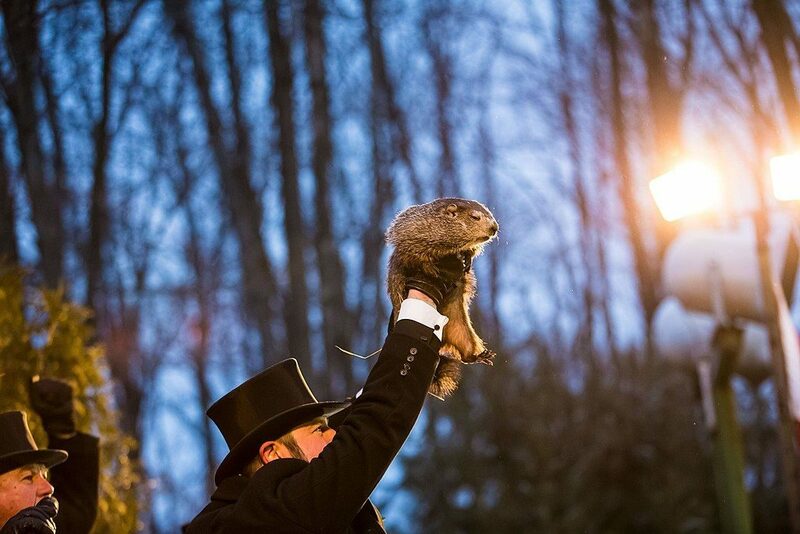 Read more about Groundhog Day at Penn Live. Mark P, Thanks for passing along this story from Eire, PA.
And here is a museum specimens of a biltaeral gynandromorph evening grosbeak: https://www.birdsoutsidemywindow.org/2010/12/31/anatomy-w-and-z/ Truly amazing.